The Sonic Genome is maybe the most thrillingly ambitious experiments by Anthony Braxton: its goal is the creation of an interactive musical environment. For eight continuous hours, fifty-plus performers use the compositions and improvisational languages developed by Braxton through his forty years of artistic investigation to create a living sound world. The Ghost Trance Music serves as the connecting principle for the musical structure. Ensembles form and split apart like cells dividing and reforming into new organisms; likewise, the members of the audience (or “friendly experiencers,” as Braxton would call them) are invited to be active participants, choosing who and what to listen to as they move about the space. Described as “less a compositional strategy, and more a utopian model for an ideal democracy,” Anthony Braxton’s music finds its definitive expression in the Sonic Genome. The entire body of around sixty musicians was divided into 12 ensembles, named after the characters in Braxton’s “Trillium” opera, 12 like the language types that the composer long ago identified as building blocks of his music. Each performer can pull from throughout Braxton’s rich oeuvre, from solo and duet music to operas and compositions for creative orchestra. Musicians can improvise in reaction to the sounds around them, choose to remain silent and simply listen, or walk out, but the activity in the space continues unabated. Braxton was assisted by choreographer Rachel Bersen, and by his ex-sudents, now major musicians in their own right,Taylor Ho Bynum and James Fei, conducting and coordinating. 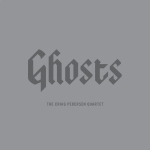 On Ghosts, trumpeter Craig Pedersen leads his quartet through 18 minutes of composed avant-jazz. Also featuring Linsey Wellman on sax, Joel Kerr on bass, and Eric Thibodeau on drums, the five tracks of this release are dense with ideas and texture. An immediate comparison can be made to Albert Ayler, though Pedersen captures more of Ayler’s spirit than sound. The group alternates between discordant, horn-driven pieces and more introspective, antebellum efforts. But even on the quieter pieces, there is a subtle tension boiling beneath the surface that occasionally explodes into a free blow-out. With none of the tracks reaching five minutes, Pedersen and company force themselves to make a statement then walk away. Ghosts is a compelling statement, both haunting an energetic. Let’s hope that this quartet returns for more. Zooom Trio; Christian Lorenzen / David Helm / Dominik Mahnig – What’s for Dessert?